The following foray into the absurd is a tribute to the delightful gamebooks of the 1980’s. It was written as an unrelated companion piece to my second album Deprecado… though there are a few commonalities if you dig deeply enough. Also, as you may be aware, I often incorporate fans into my art, so a fb “liker” has been written into the online story for a cameo. 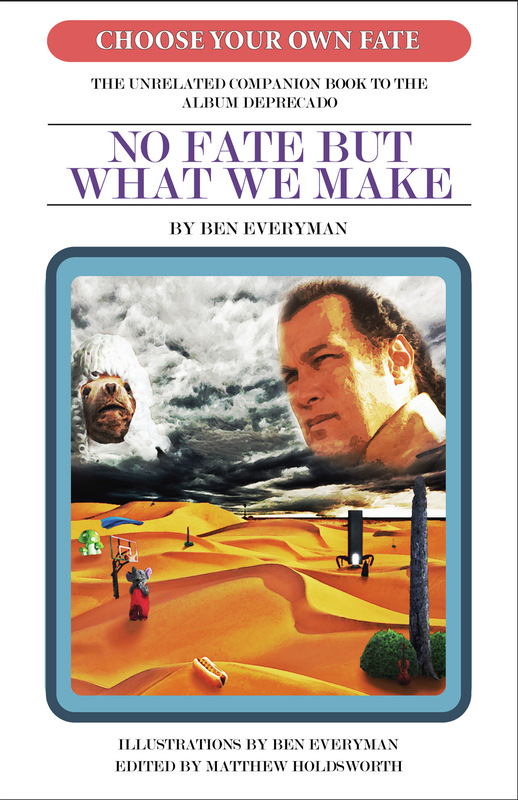 Yes, it’s true the online version of the adventure is free to enjoy and your choices nearly infinite, but if you happen to download the new album you will get a free e-book with illustrations and a myriad of alternate endings…. and my new album. Also, there is a limited edition stash of printed books available for those who fear computers or hoard trivial things. So the book of choices begins appropriately enough… with a choice.